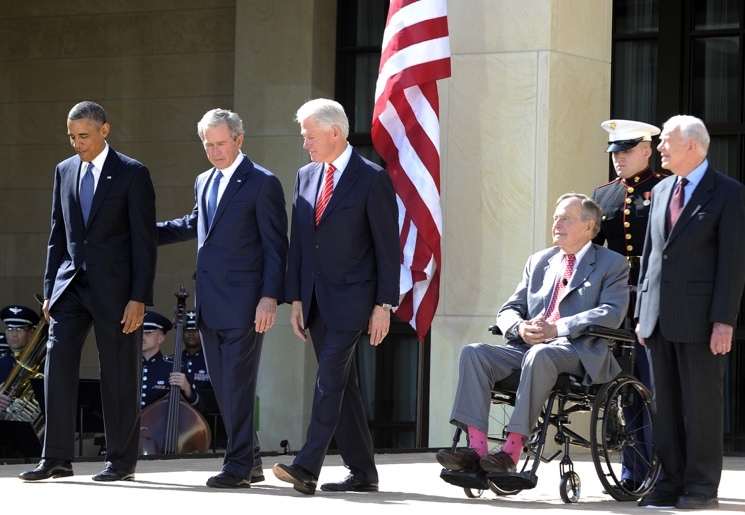 Home News What is George W. Bush Doing Now That He is Not President? What is George W. Bush Doing Now That He is Not President? George W. Bush followed in his father’s footsteps, George Herbert Walker Bush, and became the 43rd President of the United States in 2001. He served the maximum 2 terms and ended his administration in 2009 when he was replaced by Barack Obama. Although popular in the beginning, during the end of his second term Bush’s presidency was fraught with criticism from conservatives, liberals, and the general public due to his handling of a series of disasters, 9/11 terrorist attacks and Hurricane Katrina that displace thousands in Louisiana, that struck during his tenure. After leaving office, Bush returned to his home state of Texas and bought a house in Dallas where he refused interviews with media outlets for twenty-two months. In the two years since he left office, George Bush wrote a book called Decision Points. The memoir was acquired by The Crown Publishing Group and released to the public on November, 2010. The book’s topic is about the 14 most defining and critical decisions he made during his career as President. The former president was paid $7 million for 1.5 million copies and he has been on a national tour promoting it. The book has only been out for a few weeks and is already sparking controversy. Specifically, Huffington Post writer Ryan Grim charges that George Bush plagiarized material from other sources and is trying to pass them off as word for word memories of events. So far, reactions to the books have been mixed. Kanye West, who once clashed with George Bush over his handling of Hurricane Katrina, stated that his attitude changed a little about the former president after reading the book. Maureen Dowd wrote a review in the Times opinion pages that praised the book for its storytelling but criticized George Bush for his poor decision making abilities. 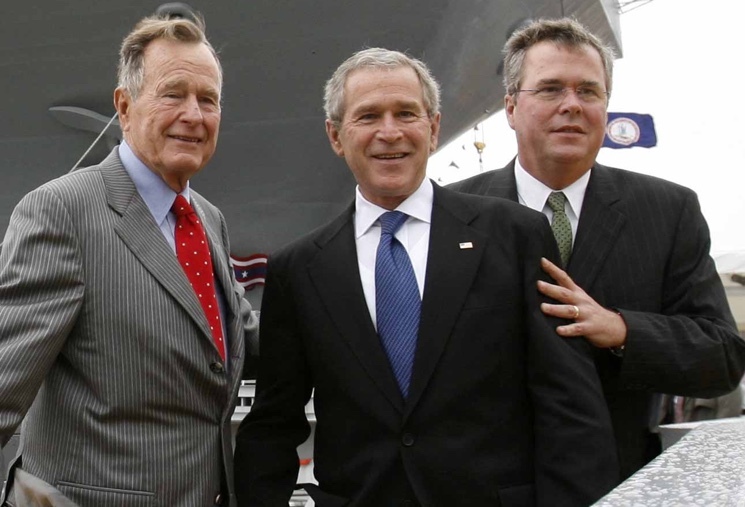 As of November 2010, Bush has appeared, or is scheduled to appear, on Oprah, Rush Limbaugh, Matt Lauer, Candy Crowley, and Sean Hannity to discuss and promote his book. 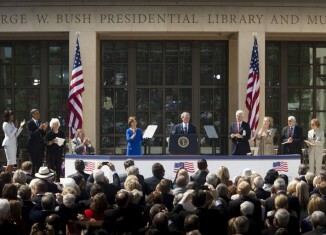 Besides producing a memoir, George Bush has also been circulating the globe on a public speaking tour. His first appearance was in front of a business audience in Calgary, Canada. He is currently being represented by the Washington Speakers Bureau who also has Tony Blair and Laura Bush as clients. 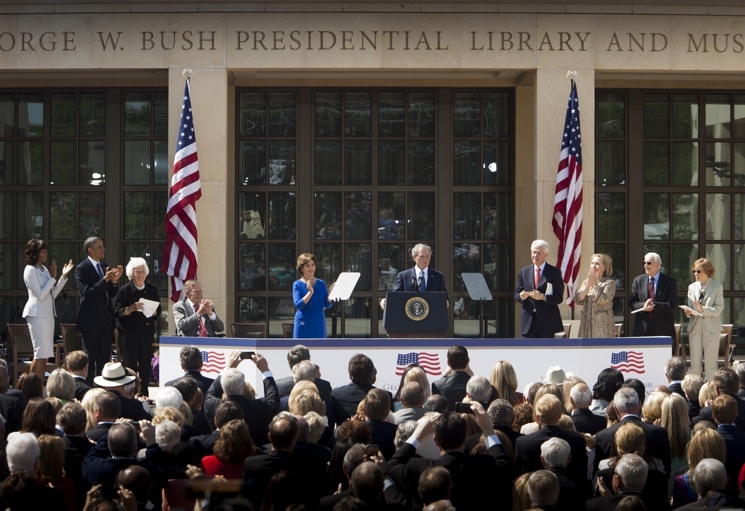 This year, George Bush is breaking ground on his Presidential Library which is set to be finished in July of 2013 and open for visitors in September 2013. I just wanna now how much would he pay if i know someone who made him as president? Forget Bush and forget his book “Decision Points”, instead read a BANNED book like “America Deceived II” by E.A. Blayre III. Mr. Bush, my name is George also Just called to say hello. Maybe we will meet. Somehow I think we are still connected. For God’s sake! We should all forget this thug and all his cronies for screwing up the whole world! It seems to me that the good people of America are too soon to forget some things. People accuse me and many many others of being a theory conspirator, but come on people, open your eyes! The governments and media feed us crap most of the time, and what is appalling is that people eat it up! I for one would not want the man to get one red cent from me. It’s beyond my comprehension why ppl. spend their hard earned money to make sure thugs like George Dubyah stays rich! Very rich. Lastly isn’t it odd that Obama was able to get rid of Osama soon after George left? This scumbag needs to be arrested now!!! treason, war crimes and the real person behind 9/11 also help steal and launder trillions. him and chenny along with others killed 3,000 american on sept 11th 2001.
bush is the real terrorist i am not scared of al-kiada i am scared of the militarty industrial complex iran contras neo cons.